High-energy particles at centre of Milky Way now within scope of Large Hadron Collider. It is one of the most disputed observations in physics. But an explanation may be in sight for a mysterious excess of high-energy photons at the centre of the Milky Way. The latest analysis1suggests that the signal could come from a dark-matter particle that has just the right mass to show up at the world’s largest particle accelerator. 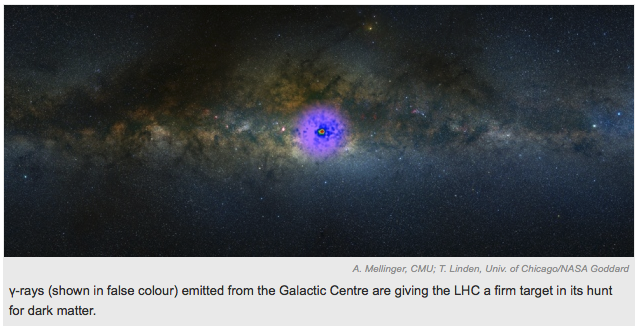 "Mysterious galactic signal points LHC to dark matter"